Product prices and availability are accurate as of 2019-04-23 14:13:02 EDT and are subject to change. Any price and availability information displayed on http://www.amazon.com/ at the time of purchase will apply to the purchase of this product. The Hero is exceptionally lightweight unit. It allows you to move through small spaces with ease and stability. It also fits easily in most car trunks and assembles easily in seconds without tools. The 3 wheel mobility scooter has a swivel seat that makes it easier to get on or off. The adjustable seat height will offer greater accessibility to individuals of different sizes and can be used indoors or outdoors. It also features puncture proof tires for longevity and less maintenance. With its patented quick connect battery pack, charging your scooter has never been so easy. The Shoprider Hero allows for an ease of mobility with an automatic start feature; no key is required. Each Battery Module Weight: 15 lbs. Top Speed: 3.80 Mph Turning Radius: 33" Heaviest Piece: 40 Lbs. 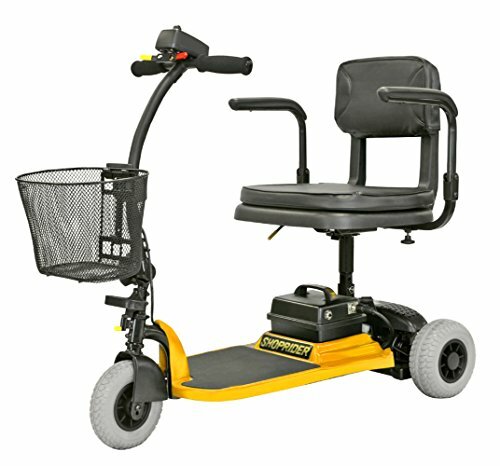 Battery Charge Distance: 8.00 Miles Weight Capacity: 250 Lbs.